Campers and hikers that make the trek on multiple day adventures count on a solid cooler to bring with them on their journeys. A solid, well-built cooler ensures that any food and beverage brought along on the trip stays cold and fresh until the trip is over with. But, as adventurers look out into the market for available coolers, the options are endless. For most campers, hikers and backpackers, an entry level coole﻿﻿r just doesn’t cut it for long trips that often take place in warm climates. Cheaper entry-level coolers just can’t stand up to the test that a long-term adventurer puts the coolers the coolers through because, let’s face it, nobody wants a cooler full of melted ice and warm food and drinks by the second or third day of their trip. So when looking at rough, touch and durable high-end coolers, two brand names rise the ranks to the top of the list in Grizzly and Yeti coolers. 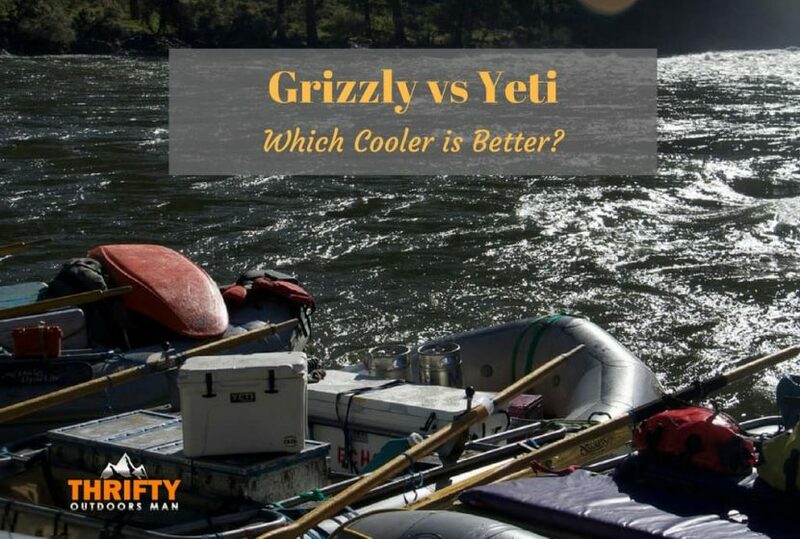 Here, we will take in an in-depth look at both of the brands and truly put both to the challenge in the Grizzly coolers vs Yeti coolers debate. When looking at the two brands, we’ll compare each company, how they manufacture their coolers, what sizes and models they carry, prices, warranties and review tests that have been performed on the brands. Hopefully, this will clear up the best cooler in the Yeti vs Grizzly debate. Yeti Coolers is based out of Austin, Texas and is a company that was started by brothers Ryan and Roy Seiders. The brothers grew up avid outdoorsmen with a father who designed and built fishing rods. The brothers, after college, would go on to be entrepreneurs in the fishing industry as well working with rods and building boats. Soon though, while still in their youth, the brothers saw a need for a high end, quality built cooler and they started the Yeti Coolers company. Currently, the lineup of Yeti coolers are manufactured at facilities in Iowa, Wisconsin and in the Philippines due to demand being so high for the product. On top of hard-shelled plastic coolers, Yeti also manufactures soft coolers, drinkware, heavy-duty duffel bags, buckets and camping chairs. Grizzly Coolers is a manufacturer based out of Decorah, Iowa right here in the United States. They are solely manufactured in Iowa by Iowa Rotocast Plastics, Inc. The plastics company has been producing great coolers in the market for over 30 years and has recently introduced the new Grizzly brand onto the world. On top of the hard shell coolers, Grizzly also produces soft coolers and drinkware to help keep beverages cold. But what truly makes a cooler great is how the cooler is constructed and what components make up the cooler itself. In the Grizzly vs Yeti showdown, each company uses unique materials and techniques to produce their final product of coolers. Beginning with the construction from Yeti, their hard-shelled coolers are constructed with what Yeti calls a Fatwall design, which features thick walls that hold two inches of insulation. The insulation in the Yeti coolers is pressure-injected polyurethane foam that is injected up to two inches thick. The insulation is the magic touch to keeping the interior of the cooler colder for longer and holding ice for lengthy amounts of time. The final piece to the construction of Yeti’s outer shell is a plastic manufacturing process called rotomolding, where hollow plastics are made by injecting a liquid resin into a mold and then rotated in an oven until the final product is complete. This manufacturing process ensures a rock solid final piece on the outer shell. Almost mirroring the Yeti construction process, Grizzly Coolers use many of the same manufacturing processes and components to make their outstanding coolers. The plastic shell of the Grizzly’s is constructed utilizing the rotationally molded construction and injected with insulations after the plastics molding process is completed. The hinges operate much the same as well with a steel pin in hinges to prevent breaking. The Grizzly utilizes rubber latches, non-slip rubber feet, tie-down slots and a rubber gasket in the lid to help keep ice longer. Yeti coolers come in a wide variety of sizes to match the needs of their consumers. From the super small to the mega-sized coolers, here is a breakdown of the sizes available along with their retails costs. After looking at the Yetis, following here is the lineup of Grizzly’s hard-shelled coolers and their price ranges. In the Grizzly vs Yeti coolers competition, with all things being equal thus far, Grizzly now takes the lead just based solely on price. As the size ranges get larger between the two manufacturers, Grizzly consistently gets lower in price. At the 60-quart size range, Grizzly comes in at $150 less expensive and at the 160-quart size range, Grizzly comes in at over $250 less than the Yeti competitor. Yeti does have the advantage though in the sheer size available that they offer to their customers. Starting with the warranty that each company puts on their coolers, Yeti backs their hard-shelled line of coolers with a five-year warranty. Grizzly, on the other hand, offers a lifetime warranty for their coolers. Both makes of coolers are certified by the Interagency Grizzly Bear Committee as bear-resistant products that are safe for food storage on public lands. The last way to finally put the Yeti vs Grizzly cooler debate to the ultimate test is in a battle of the wills. A battle to truly see which cooler can hold ice and keep food and drinks cold the longest. For campers and hikers, how the cooler performs when out in the wild is really the only test that should matter if the overall cost is thrown out the window and all other features match up pretty well against each other. No person wants to end up deep in the woods somewhere with a cooler full of melted ice and spoiling food. In one particular study of the two coolers, the Grizzly G40 and the Yeti Tundra 45 were put to a test over five days where each cooler was stocked with six cans of soda and filled to the max with ice. Over the course of the five days, the testers rotated the sodas around in the coolers by hand three times per day to try and simulate how the coolers would be used in real life. So in the end, after comparing the manufacturers, their process, the sizes, price points, warranties and testing, Grizzly and Yeti coolers are very similar coolers. The fact is that both are great top end coolers with the Grizzly coming in at just a plain old better price point than the Yeti. But, for someone looking to spend their hard earned money on a top-quality ice chest, the Yeti is a great option as well. Either way a consumer goes, they’ll most likely be happy with the results from either their new Yeti or Grizzly cooler on their next long hike or camping trip. Check out our Yeti vs Pelican comparison here, and RTIC vs Yeti, or our comparison between the Y﻿eti 35 vs 45. » Camping » Grizzly Coolers vs Yeti: Which cooler is better?